Delicate pink and luxe gold are a match made in bridal style heaven! Just like Marie Antoinette, think feminine, opulent, and bold. Glamorous touches like a clear and gold crystal bridal hair comb and a vintage-inspired Swarovski-encrusted cuff bracelet are a divine combination, especially when paired with a wedding gown of the palest pink (embroidered in gold, of course). 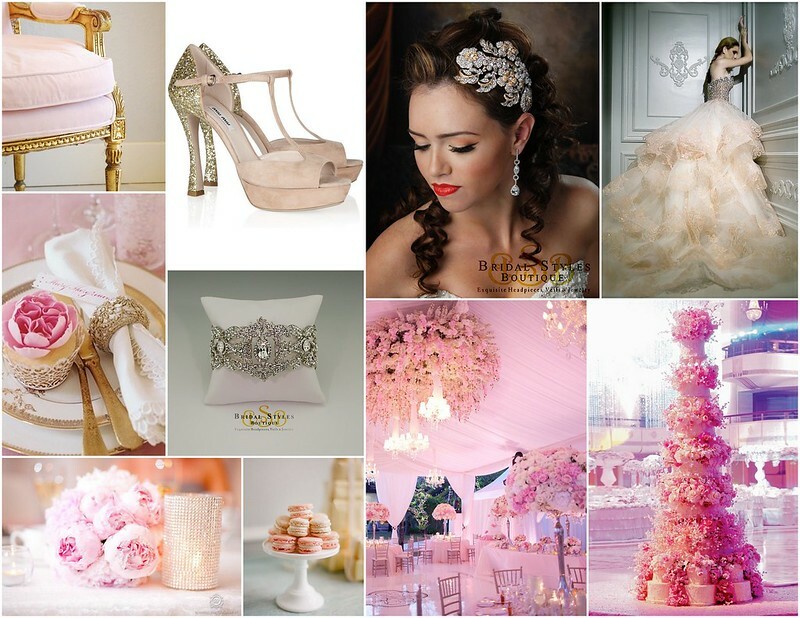 When planning your wedding reception, gild your soft pink hue with details. We’re thinking lush flowers, decadent macarons and place-settings that would make any elegant queen’s heart sing. To find the perfect bridal headpieces and jewelry to complement your glamorous bridal look, visit us in Brooklyn at our bridal accessory boutique! This entry was posted on Tuesday, September 11th, 2012 at 12:09 pm	and is filed under Inspiration. You can follow any responses to this entry through the RSS 2.0 feed. You can skip to the end and leave a response. Pinging is currently not allowed.